In December 2018, E-mini Nasdaq futures trading averaged 732,849 contracts per day, more than double the average of December 2017 and a record for any month since the contract was launched in 1999, according to CME Group data. E-mini Nasdaq 100 futures trading soared as tech stocks tumbled sharply to close 2018, amid concern over potentially slower growth and other factors. Prices have since bounced back, with the Nasdaq 100, the underlying index on which the E-mini Nasdaq is based, trading around 6,872 at the beginning of February, up 16 percent from a 15-month closing low Dec. 24. 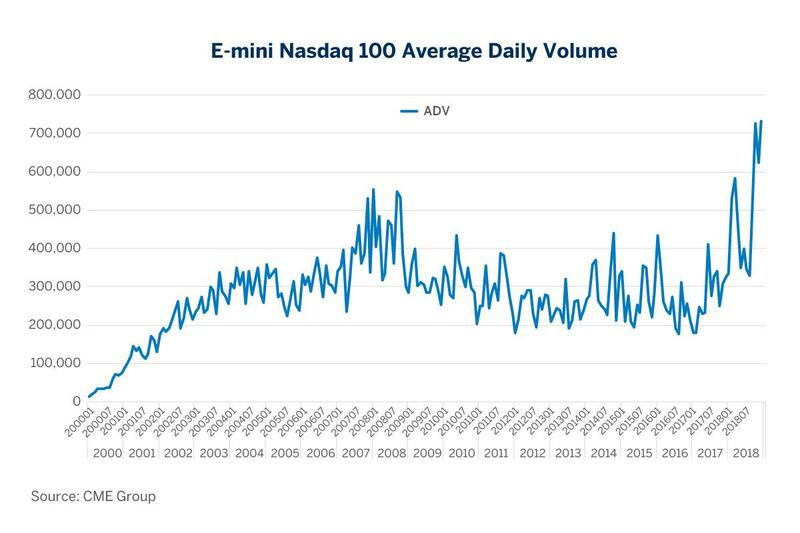 The fundamentals driving volume in the E-mini Nasdaq 100 might be summed up in a couple words: name recognition, said Tim McCourt, CME Group’s Managing Director of Equity Products. FANG companies — Facebook (FB – Get Report) , Amazon (AMZN – Get Report) , Netflix (NFLX – Get Report) and Google (GOOGL – Get Report) — are deeply embedded in so many people’s lives (another version of the acronym, FAANG, includes Apple (AAPL – Get Report) ). Surging trading in the E-mini Nasdaq 100 late last year continued a trend that started in 2017, as escalating trader and investor interest in FANG stocks extended into close proxies. FANG stocks had a combined market capitalization of about $2.2 trillion as of Feb. 1, or nearly 30 percent of the Nasdaq 100’s total market cap of nearly $7.7 trillion. FANG companies are also prime examples of “story stocks,” generating news of some form or another in the financial media every day. The E-mini Nasdaq 100’s close correlation with FANG movements means it comes in handy for professional investors and traders, said Jim Cagnina, Executive Senior Vice President at Infinity Futures, LLC, a Chicago-based online broker. McCourt said that as the tech sector’s prominence grew in recent years, he’s been seeing different types of participants in the E-mini Nasdaq 100. This includes more hedge funds and other varieties of asset managers deploying different types of strategies. Additionally, 23 percent of trading volume in 2018 originated outside the U.S., up from 15 percent in 2012. For all of 2018, an average of 492,839 E-mini Nasdaq 100 futures contracts changed hands each day, up 78 percent from 2017. Last October, CME Group and Nasdaq announced a 10-year extension of CME’s exclusive license to offer futures and options based on the Nasdaq 100 and other Nasdaq indexes. This year marks the 20th anniversary since Nasdaq and CME originally partnered on the e-mini. “We have been partners with CME Group for more than 20 years and extending our relationship enables market participants access to our global benchmark products in order to manage their equity market risk,” Nasdaq President and CEO Adena Friedman said in a press release announcing the extension. Many of these traders are attracted to a few key features that E-minis offer, McCourt said. These include near 24-hour-a-day market access, deeper liquidity (an average notional value of $95 billion in E-mini Nasdaq 100 futures traded each day in the fourth quarter 2018, about seven times the value of Nasdaq 100-linked ETFs) and certain tax benefits. Under U.S. tax code, E-minis are considered “Section 1256” contracts offering “blended capital gains,” which can provide an easier way to address tax implications. Cagnina, of Infinity Futures, noted that many Nasdaq 100 companies release announcements or disclosures after the close of regular, daily equity trading, or before the opening bell. The nearly round-the-clock trading in E-mini futures enables traders to respond right away to any market-moving news. Despite the occasional market bumps, FANG stocks and others in the tech sector retain a positive longer-term outlook. That means the Nasdaq 100 index and related gauges will be followed closely in the years ahead.